Dr. Plitas accepts the following list of insurance providers. Select your insurance provider to see more details. I am a surgical oncologist who specializes in the treatment of patients with breast cancer. My colleagues and I on the Breast Disease Management Team (which includes breast surgeons, plastic surgeons, medical oncologists, radiation oncologists, radiologists, and pathologists) provide state-of-the-art, compassionate care for breast cancer patients. I specialize in breast cancer surgery and provide the full range of procedures including breast conservation surgery (lumpectomy), mastectomy with immediate breast reconstruction, and sentinel lymph node biopsy. In addition to taking care of my patients, I am actively engaged in research involving how the immune system can be used to fight breast cancer. I became interested in immune responses during a three-year research fellowship at Memorial Sloan Kettering Cancer Center where I studied the immune system in the setting of inflammation and infection. During this time significant advances were made in understanding the immune response to cancer. It became increasingly clear that there were many new possibilities to improve the outcome of cancer treatment. These exciting opportunities drove my decision to study immunology in the context of cancer research. Following a two-year Surgical Oncology Fellowship at Memorial Sloan Kettering, I joined the surgical faculty on the Breast Service. 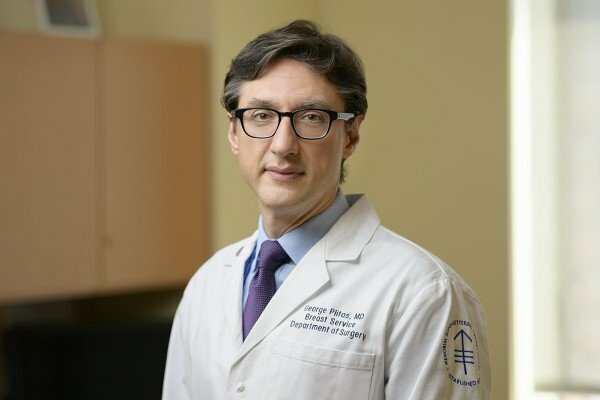 Working in collaboration with Dr. Alexander Rudensky, Chair of the Sloan Kettering Institute’s Immunology Program, I conduct research focused on understanding how breast cancers decrease potentially beneficial anti-tumor immune responses. The resources available at Memorial Sloan Kettering allow me not only to provide the best possible care to my patients but also to conduct research that may help all patients with breast cancer. Visit PubMed for a full listing of Dr. Plitas’s journal articles. Pubmed is an online index of research papers and other articles from the US National Library of Medicine and the National Institutes of Health.